It was originally created as part of the Hawaii National Park along with the volcanoes of Mauna Loa and Kilauea on the island of Hawaiʻi in 1916. Hawaii Volcanoes National Park was made into a separate national park in 1961. The park area was designated an International Biosphere Reserve in 1980. 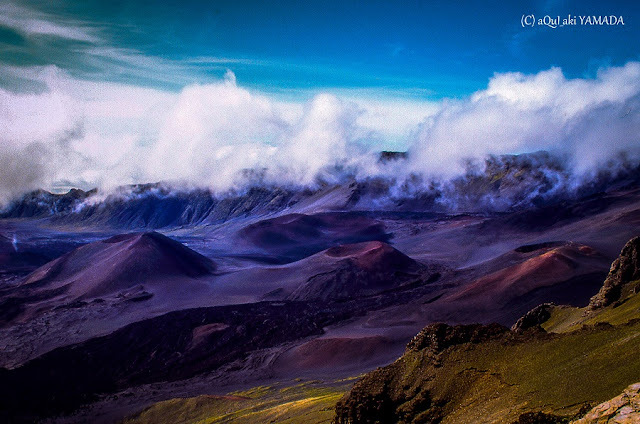 The name Haleakalā is Hawaiian for "house of the sun." According to a local legend, the semigod Maui imprisoned the sun here in order to lengthen the day. The Hawaiian National Park Language Correction Act of 2000 was proposed to observe the Hawaiian spelling, but it did not become law. An extremely winding but well maintained road leads up the mountain. The summit area includes Haleakalā Crater, the summit of the volcano, and the area surrounding the summit. This part of the park is accessed by Hawaii state road 378. There is a visitor center, with parking and restrooms, near the summit. At the summit itself is another parking lot and a simple observatory without facilities. Each morning, visitors come to the summit of the volcano to watch the spectacular sunrise. More visitors come each afternoon to watch the equally amazing sunset. In either case conditions can be extremely cold. One attraction of the park is Hosmer's Grove, a unique forest of alien trees including deodar (Cedrus deodara) from the Himalayas, sugi (Cryptomeria japonica) from Japan, eucalyptus from Australia, and several species from North America (pine, spruce, cypress, fir, and others). Native plants and trees are also present in the forest but are not very common due to the little light available (because of the taller alien trees). Pink Floyd - Fearless "Meddle"
Yellowstone Lake is the largest body of water in Yellowstone National Park. 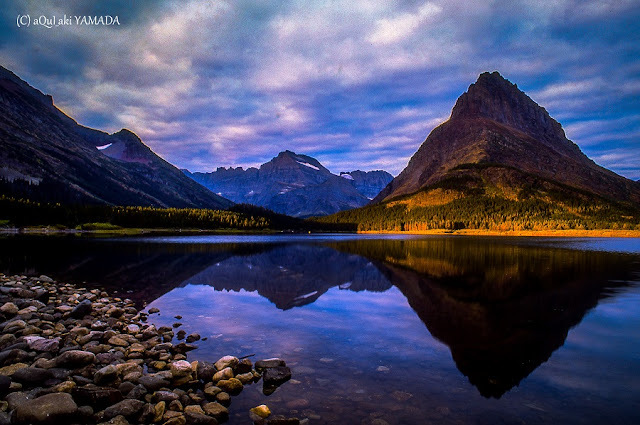 The lake is 7,732 feet (2,357 m) above sea level and covers 136 square miles (350 km2) with 110 miles (180 km) of shoreline. While the average depth of the lake is 139 ft (42 m), its greatest depth is at least 390 ft (120 m). Yellowstone Lake is the largest freshwater lake above 7,000 ft (2,100 m) in North America. In winter, ice nearly 3 ft (0.91 m) thick covers much of the lake except where shallow water covers hot springs. The lake freezes over by early December and can remain frozen until late May or early June. In the southwest area of the lake, the West Thumb geothermal area is easily accessible to visitors. Geysers, fumaroles, and hot springs are found both alongside and in the lake. As of 2004, the ground under the lake has started to rise significantly, indicating increased geological activity, and limited areas of the national park have been closed to the public. As of 2005, no areas are currently off limits aside from those normally allowing limited access such as around the West Thumb Geyser Basin. There is a 'bulge' about 2,000 ft (610 m) long and 100 ft (30 m) high under a section of Yellowstone Lake, where there are a variety of faults, hot springs and small craters. Seismic imaging has recently shown that sediment layers are tilted, but how old this feature is has not yet been established. After the magma chamber under the Yellowstone area collapsed 640,000 years ago in its previous great eruption, it formed a large caldera that was later partially filled by subsequent lava flows (see Yellowstone Caldera). Part of this caldera is the 136 sq mi (350 km2) basin of Yellowstone Lake. The original lake was 200 ft (61 m) higher than the present-day lake, extending northward across Hayden Valley to the base of Mount Washburn. 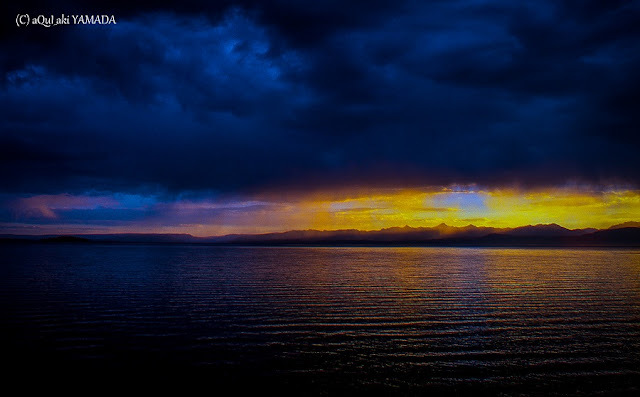 It is thought that Yellowstone Lake originally drained south into the Pacific Ocean via the Snake River. The lake currently drains north from its only outlet, the Yellowstone River, at Fishing Bridge. The elevation of the lake's north end does not drop substantially until LeHardy Rapids. Therefore, this spot is considered the actual northern boundary of Yellowstone Lake. Within a short distance downstream the Yellowstone River plunges first over the upper and then the lower falls and races north through the Grand Canyon of the Yellowstone. In the 1990s, geological research determined that the two volcanic vents, now known as "resurgent domes", are rising again. From year to year, they either rise or fall, with an average net uplift of about one inch per year. During the period between 1923 and 1985, the Sour Creek Dome was rising. In the years since 1986, it has either declined or remained the same. The resurgence of the Sour Creek dome, just north of Fishing Bridge is causing Yellowstone Lake to "tilt" southward. Larger sandy beaches can now be found on the north shore of the lake, and flooded areas can be found in the southern arms. The Hayden Valley was once filled by an arm of Yellowstone Lake. As a result, it contains fine-grained lake sediments that are now covered with glacial till left from the most recent glacial retreat 13,000 years ago. Because the glacial till contains many different grain sizes, including clay and a thin layer of lake sediments, water cannot percolate readily into the ground. This is why the Hayden Valley is marshy and has little encroachment of trees.